The legal interpretation of what a patient’s ‘valid’ consent is has developed over time. What are the implications of a 2015 Supreme Court ruling? The issue of what constitutes ‘valid’ consent can be problematic as we know from patient complaints, and the claims made to insurers. The consent requirements set out in the Osteopathic Practice Standards are based on case law that applies across the healthcare professions. The latest judgment in this area was made in 2015 by the Supreme Court and is known as the ‘Montgomery judgment’. The case involved the risks associated with a natural birth but the Court’s ruling is important and helpful for osteopaths’ practice. The Court said that there is ‘a duty to take reasonable care to ensure that the patient is aware of any material risks’. In the past, osteopaths have struggled with the notion of trying to explain all risks to patients, although in fact this requirement does not appear in the current Osteopathic Practice Standards. The important phrase here is ‘material risks’. These are defined as those where, ‘in the circumstances of the particular case, a reasonable person in the patient’s position would be likely to attach significance to the risk, or the doctor is or should reasonably be aware that the particular patient would be likely to attach significance to it’. Associated with this point, the judgment says that ’the significance of a given risk is likely to reflect … the importance to the patient of the benefits sought to be achieved by the treatment’. So the issue is not just the level of any particular risk but how the individual patient is likely to judge that risk. 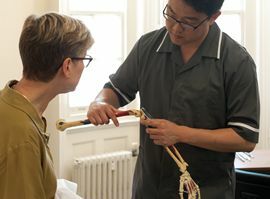 It moves us away from the idea that it is up to the osteopath to decide on something for the patient, based on the notion that this is what most osteopaths would do, and reinforces the need for the patient to be involved in decision-making. The Court made this clear by saying that ‘the doctor’s advisory role involves dialogue, the aim of which is to ensure that the patient understands’. This point is reflected elsewhere in the judgment, which says that the duty to provide information is not fulfilled ‘by bombarding the patient with technical information which [they] cannot reasonably be expected to grasp’. By having a discussion, the osteopath can check that the patient understands the risks and benefits of treatment. Finally, the Court said that the requirements for valid consent are not met by ‘routinely demanding [a] signature on a consent form’. This backs up what we say in the Osteopathic Practice Standards that consent must be an ongoing process throughout the consultation and, except in some highly specific circumstances, a consent form may be more unhelpful than helpful.